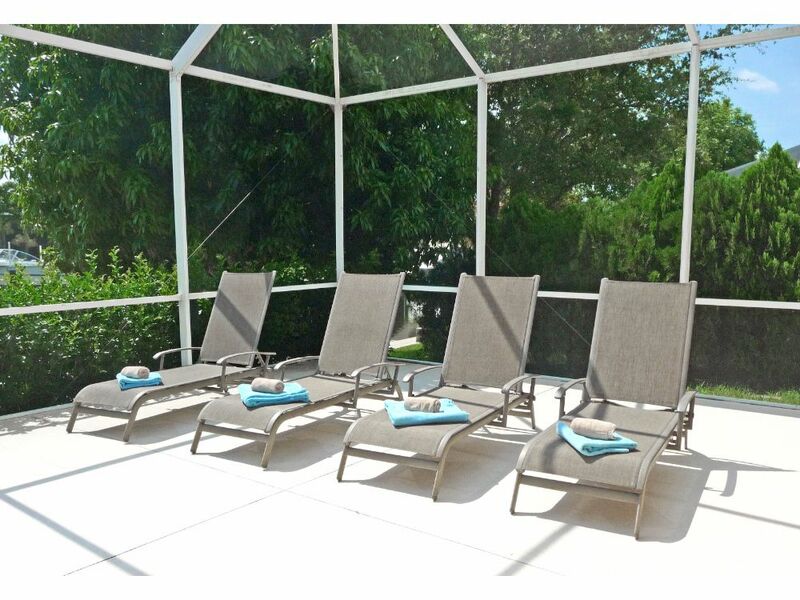 This 3 bedroom/3 full ensuite bathroom direct gulf access pool home features the popular open plan living design where living, dining and kitchen form one huge open space. 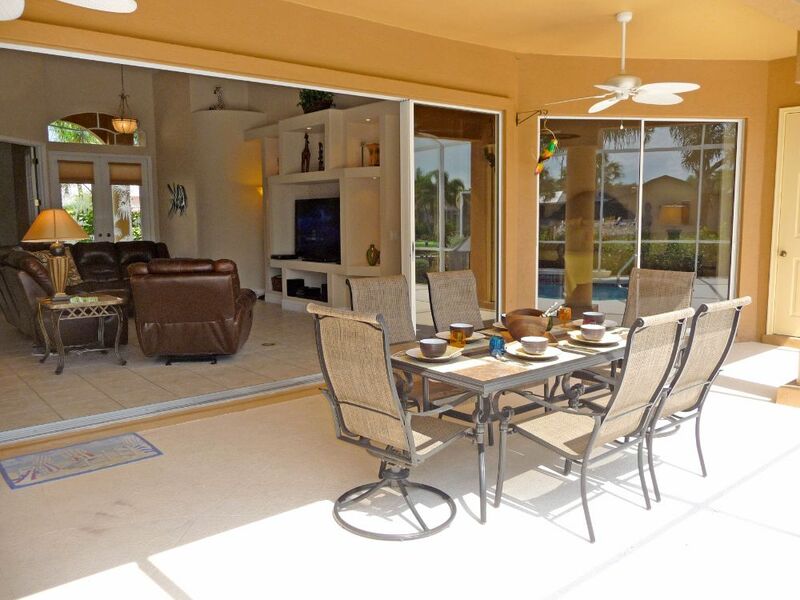 A wall of sliding doors opens up the home to an over-sized pool deck with plenty of room to dine, swim, sunbathe, barbecue or sit quietly in the shade. 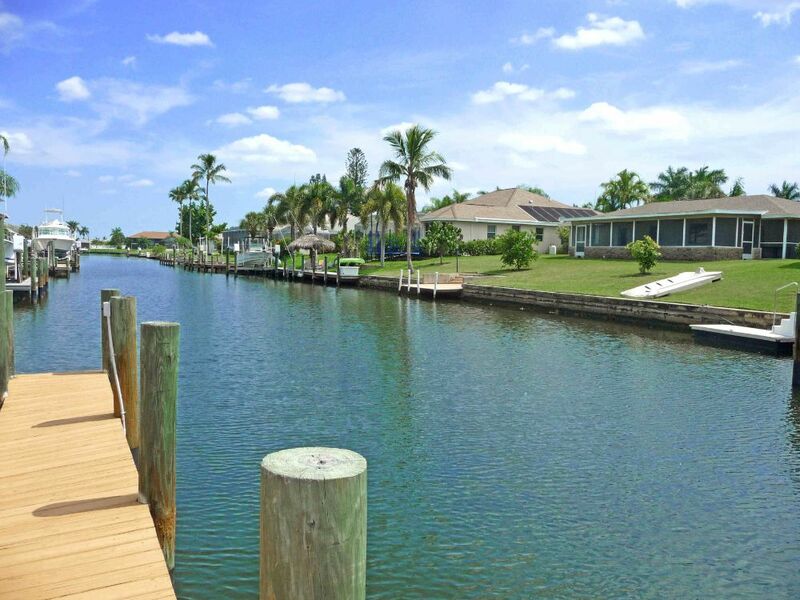 This home is the perfect choice for guests seeking a luxury home with private facilities for all bedrooms and quick direct boating access to the Gulf. Initial impressions of the home were Excellent Initial impressions of the outside areas were Excellent Furnishings, Decor was perfect, very good quality, wouldn't change a thing. We would return to this property. 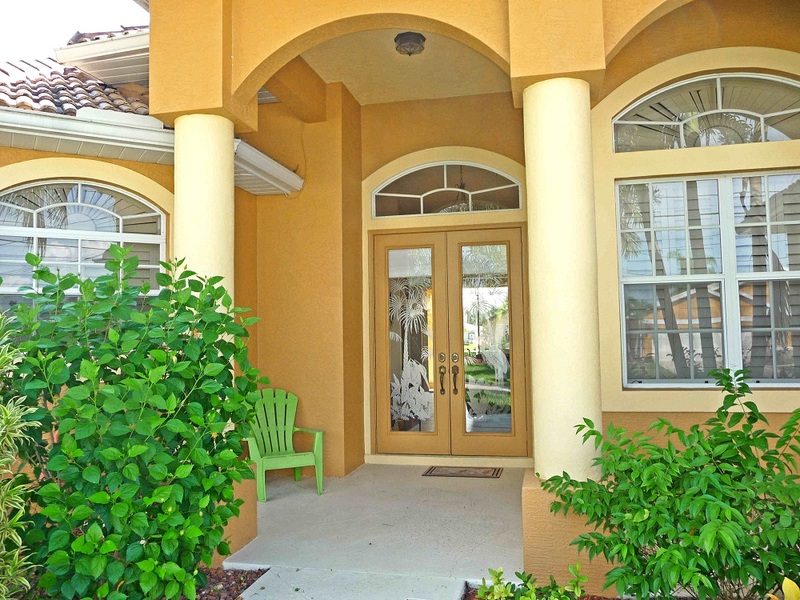 Villa Cabo Mango was an outstanding base for our stay in the Cape Coral area. The photos are completely accurate, in fact it surpassed what we had seen on the site. 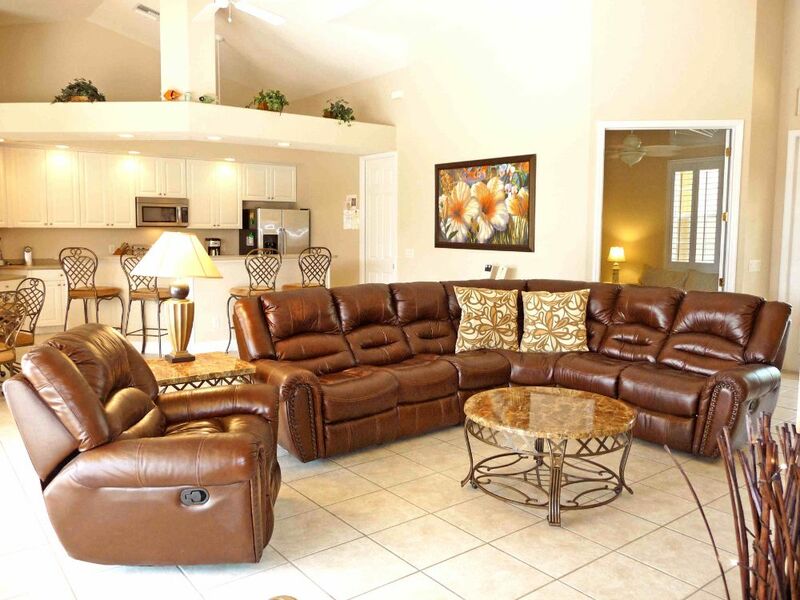 It was spotlessly clean and everything was in very good order, with very comfortable furnishings throughout. The décor was delightful, with several references to wildlife and the outdoors which we particularly appreciated. It was Florida themed which we liked a lot. 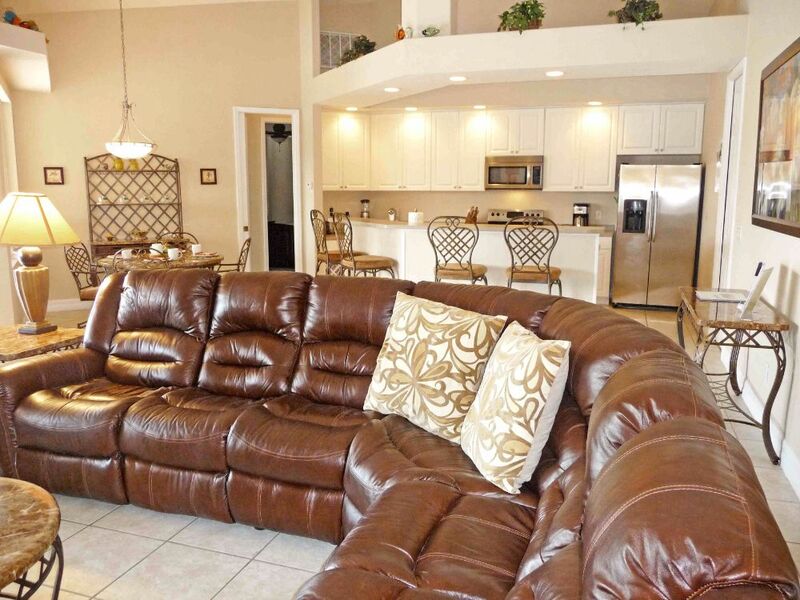 Ceiling fans in all rooms along with effective AC made the house very comfortable.The recliner sofa and chair was a very nice touch, in fact we'd love those here at home! 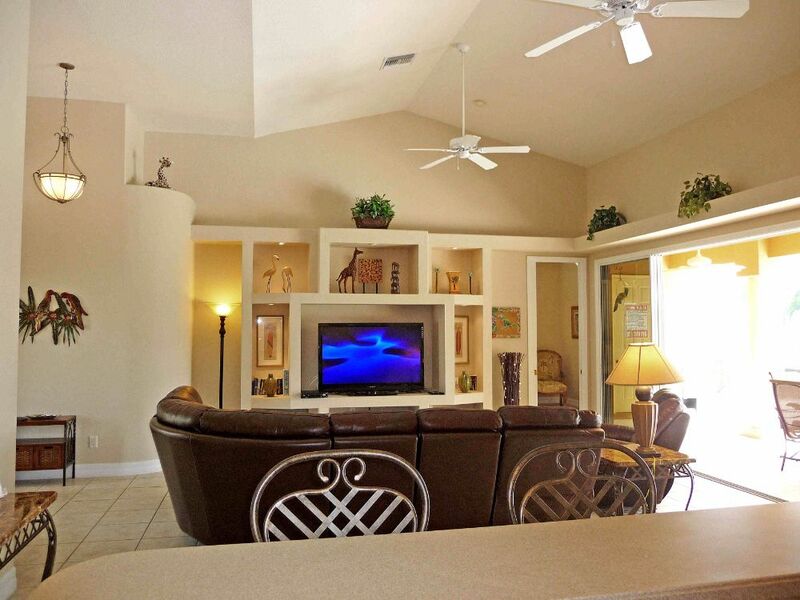 The living area has an excellent TV/DVR/BluRay too for relaxed nights in. 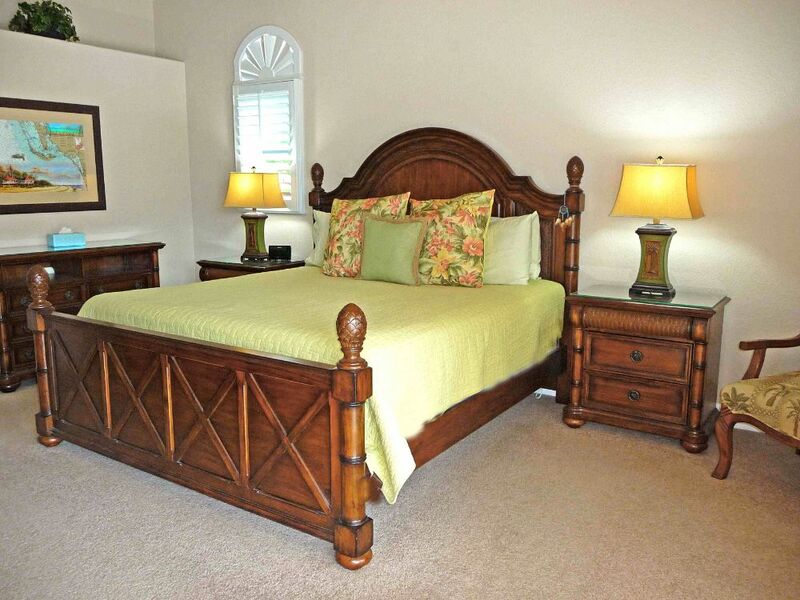 The bed in the master suite was the most comfortable we have had in several trips to Florida rental properties, with very good quality pillows and bedding. We were amazed at the size of the master bathroom too. 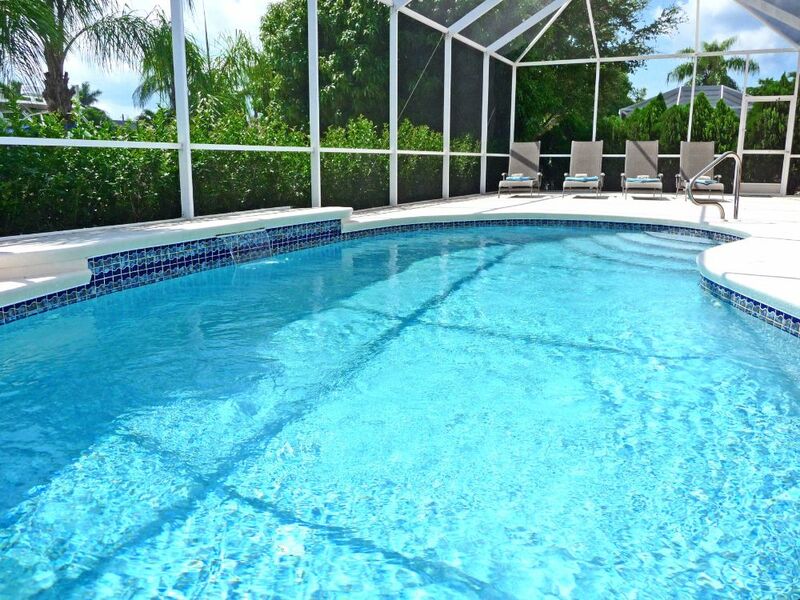 The pool area and boat dock were immaculate and well maintained. The sun loungers were good quality and comfortable too, although we had a lot of rain so didn't make as much use of them as we would have liked. 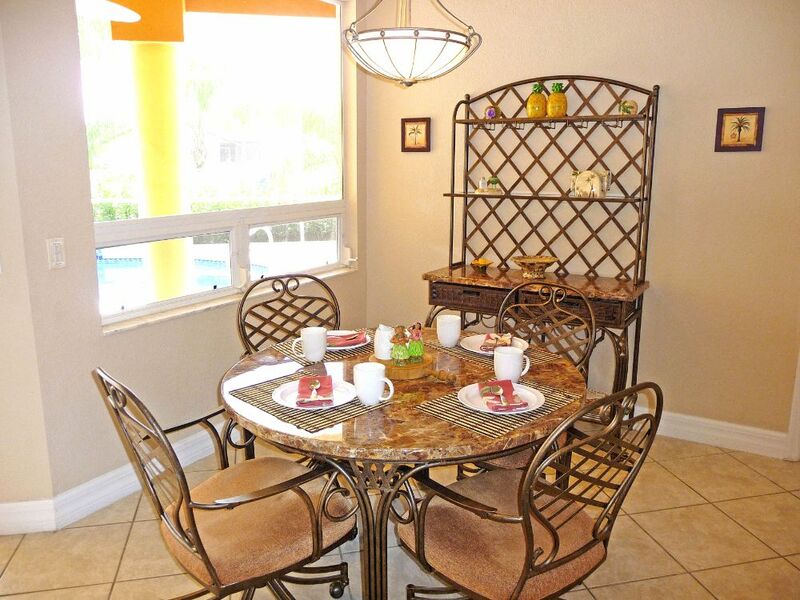 The lanai furniture was well used by us for meals etc and was very much to our taste. We made use of the boat lift to store the boat we hired for a few days, which was most convenient. It was also nice to be able to use the garage to store the car. It was extremely clean with lots of space. We really were most impressed with the whole property. Little touches like dishwasher tablets, soap, extra toilet rolls, laundry detergent etc were appreciated as not many villa rentals include any of those. Books and magazines all with a Florida or boating theme was nice too. The management company were always available for any problems or issues and contacted us both at the start and end of our stay. 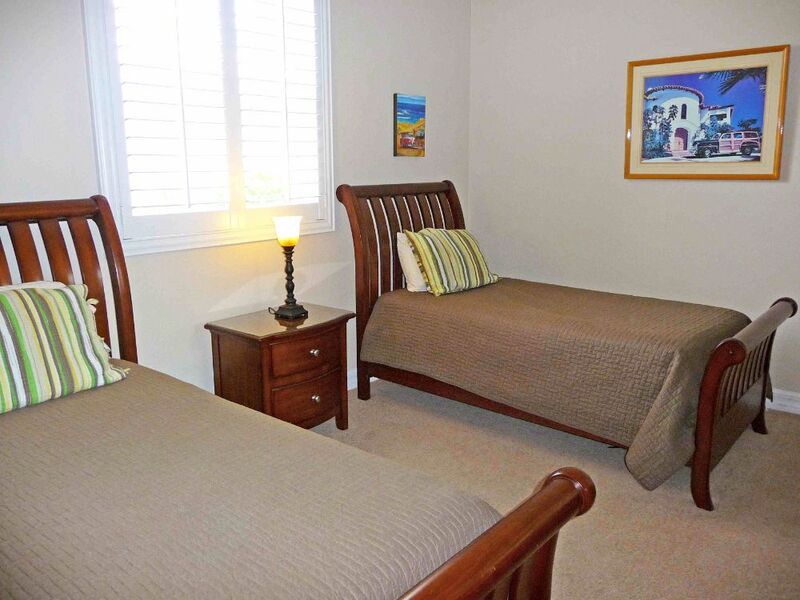 The booking process was easy and communication was very good throughout. I would have no hesitation in recommending Villa Cabo Mango to anyone who was considering staying there. My husband and I have very high standards and we can honestly say that we loved our 3 week stay. What were you initial impressions of the home on arrival? Very nice large dock with a boat lift that we enjoyed during our stay. 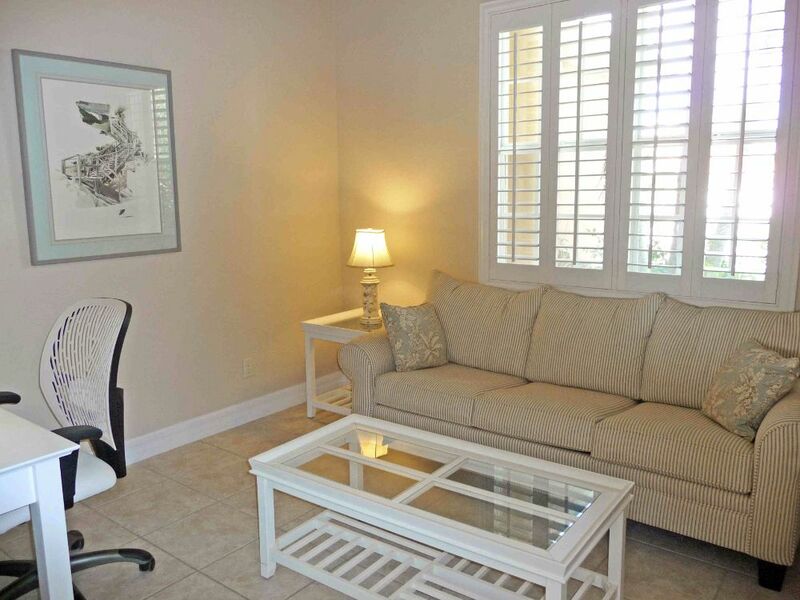 Clean, nicely furnished, spacious inside What did you think of the outside areas? 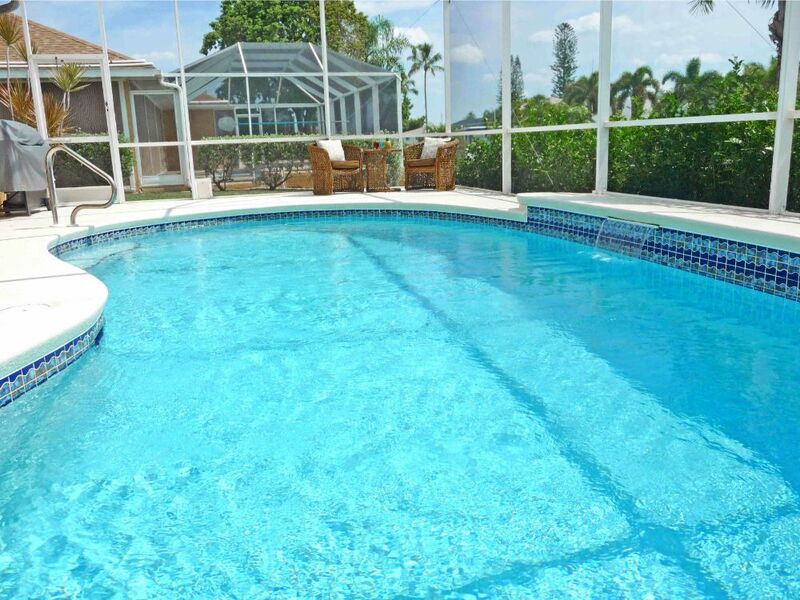 (pool, lanai est) Beautiful and well maintained. What did you think of the furnishings and the decor inside the home? Excellent, Very nice and evoked a happy Florida feeling. What did you think of the quality and amount of the linen provided? Good, a few towels, wash cloths could be replaced. The home was well equipped. We only purchased a few items mainly for our own personal use Would you return to this home again? Yes, we are coming back in December 2013. 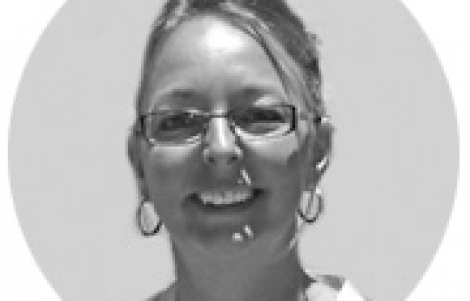 Did Churchill Property Services do everything you would expect from them? Yes, very nice to work with. We have no complaints. Everything taken care off in a professional and friendly manner. 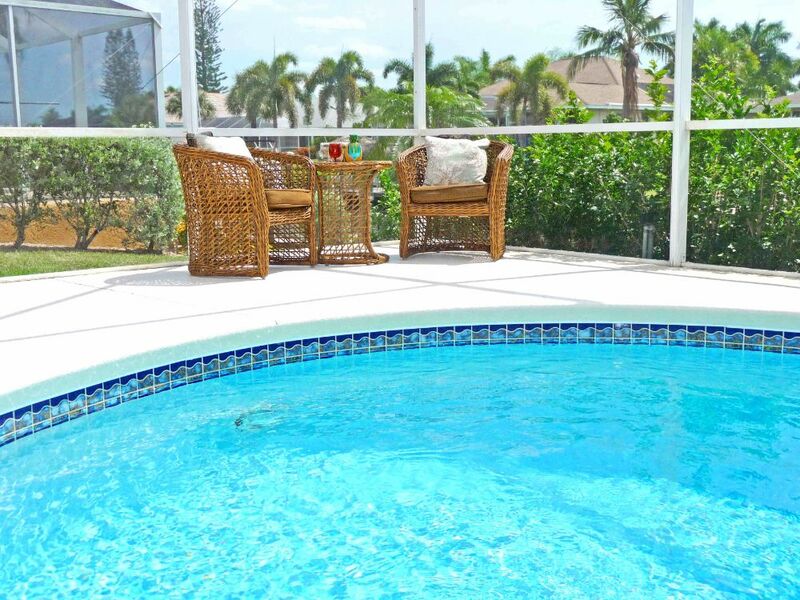 Amazing Vacation Spot	★ ★ ★ ★ ★ Our family spent the week at this lovely home at the end of July. It was a last minute decision to spend our last week of summer vacation together away from the hustle bustle of home. Best decision ever! The owner was so helpful and accommodating. The management company so helpful. We lacked for nothing in this home. 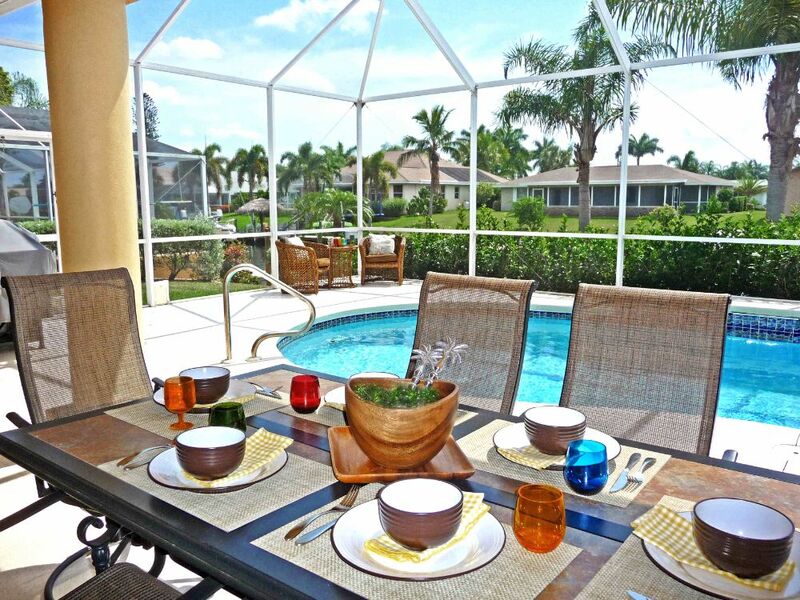 Although the Florida sunshine tried to hide, we found many sunny moments. From dips in the pool to sunsets on the dock, we enjoyed every moment. So many beaches to discover nearby. Our favorite was Sanibel Island where we got to swim with a dolphin! Oh, the mango tree in the back was the icing on the cake. We will be back and if this house is available, we will call it home once more. I promise you will not be disappointed. 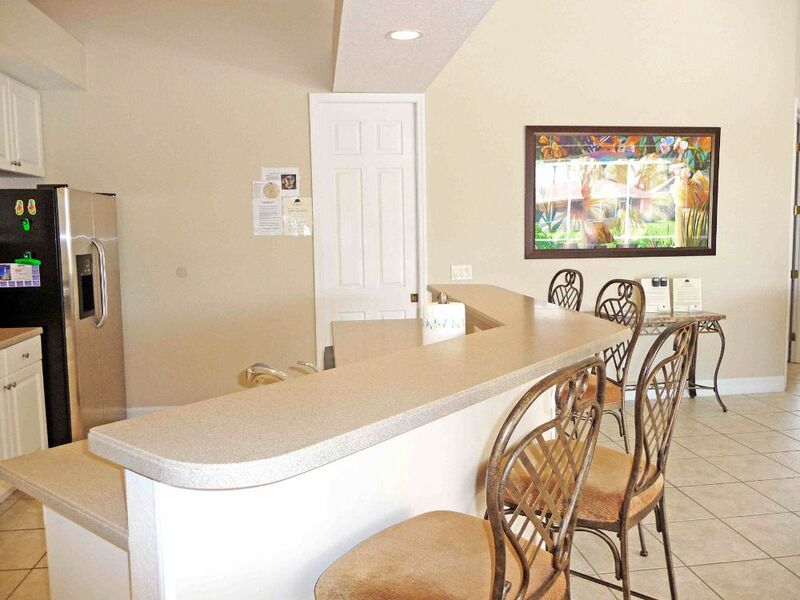 We have stayed in many vacation homes and this is one of the cleanest and neatest layouts we have had. 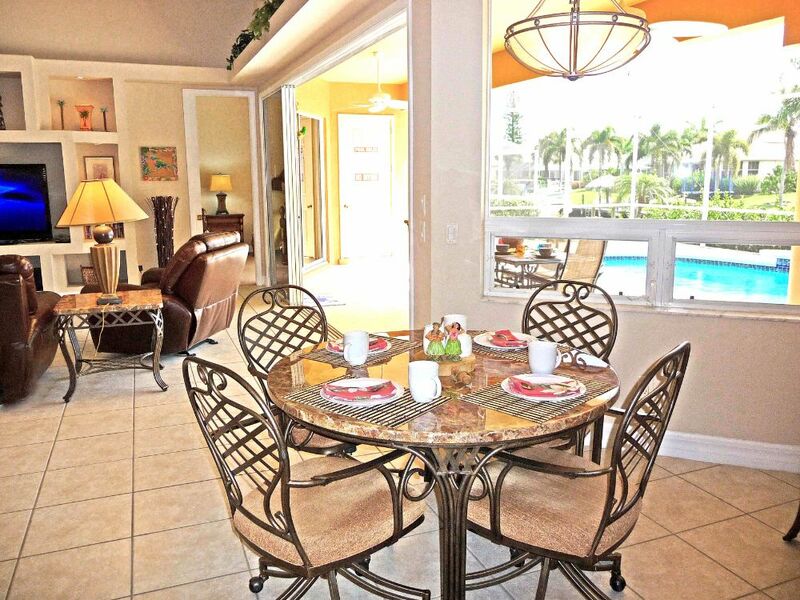 Open plan kitchen overlooking Living area, breakfast area & pool. 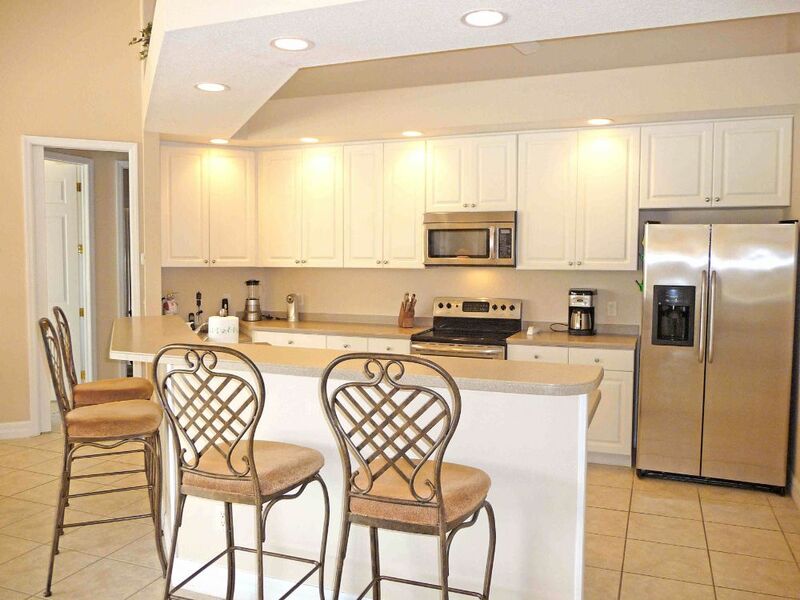 Equipped with stainless steel appliances & finished with corian worktops. Also Gas BBQ in lanai area for cooking in the sun! 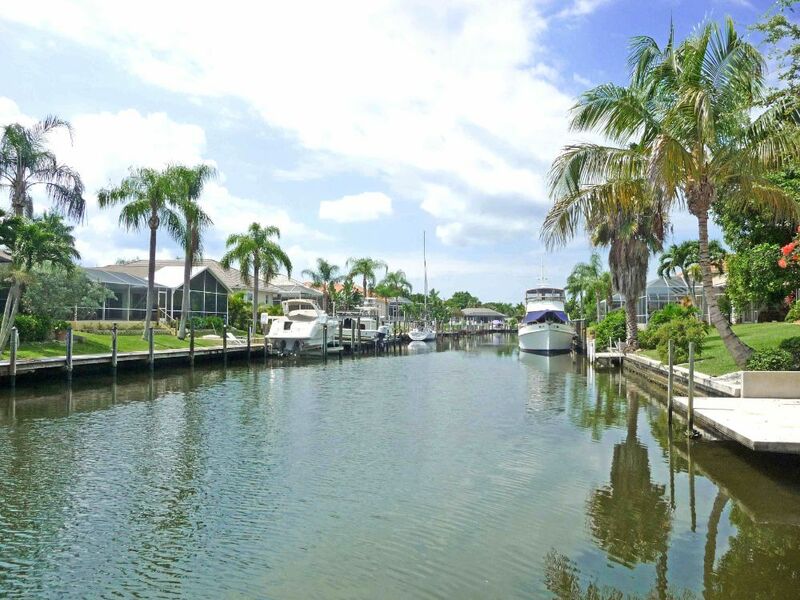 Villa Cabo Mango is the perfect home for boaters seeking a spacious residence with un-matched quick access to the Gulf of Mexico. 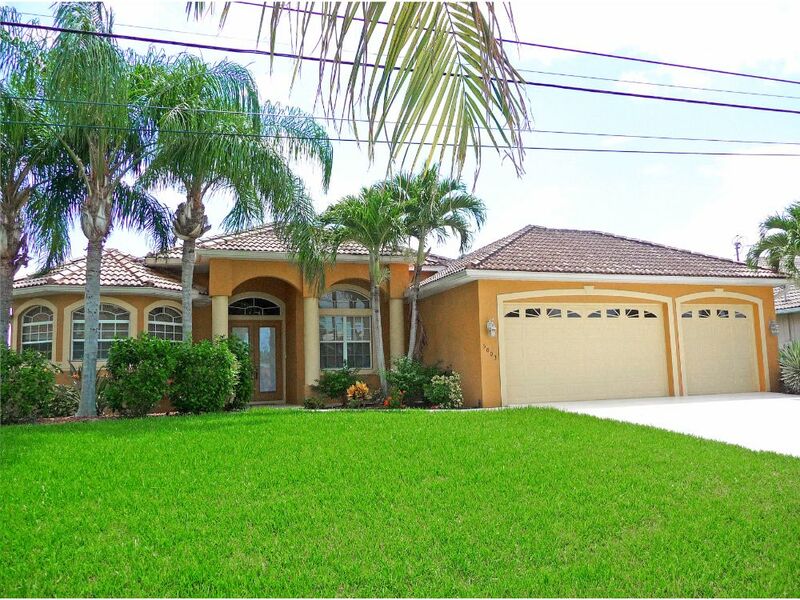 Situated in the popular 8 Lakes/Tarpon Point area of Cape Coral, the home is modern in its' design and appointments.On stepping through the double-door entrance you will be greeted with the very popular Great Room layout where living, dining and the kitchen are combined to make one spacious main living area. 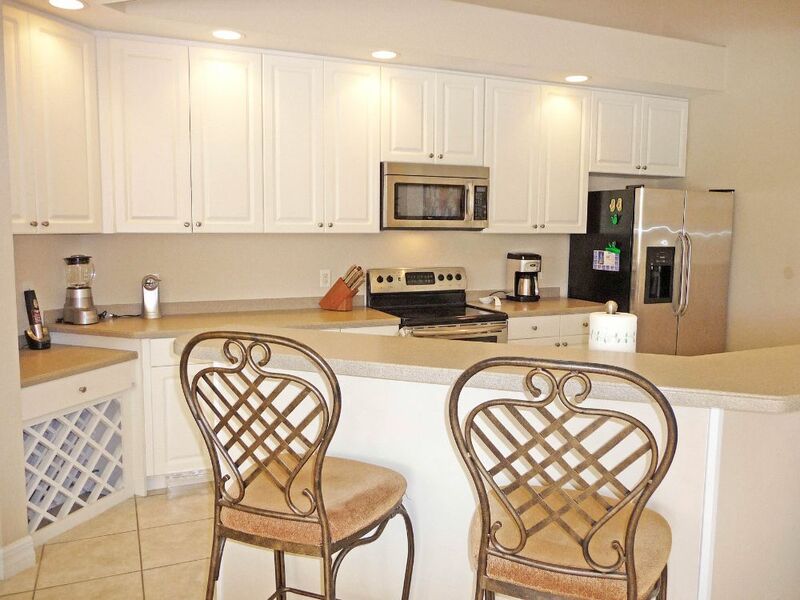 Furnished with reclining soft leather sofas and decorated in warm, modern tones, the quality of this home is instantly apparent.The Kitchen has been finished with stainless steel appliances and corian counters so to meet the needs of the most demanding of gourmet cooks. There is also a separate den furnished with a desk, comfortable sofa and coffee table so an ideal spot to work from or a quiet place to retreat and read a good book. 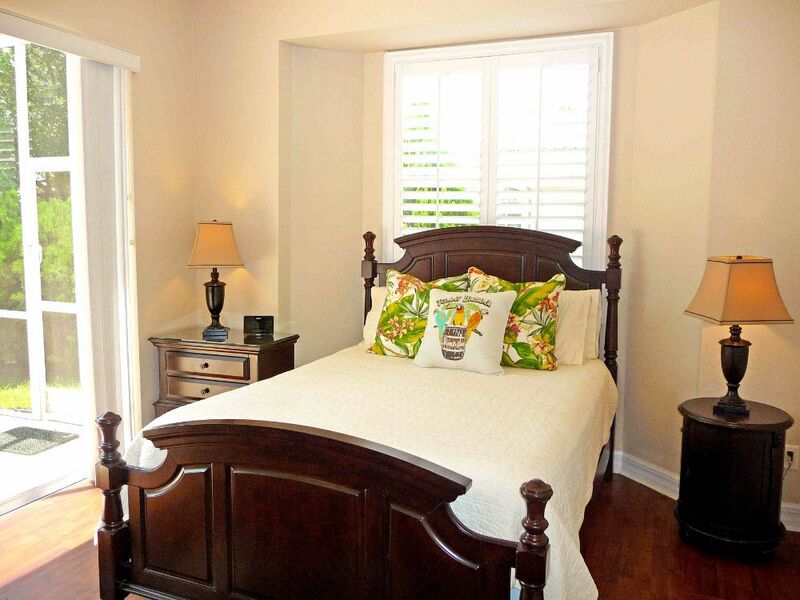 The Master suite is spacious and upscale in its' appointments. 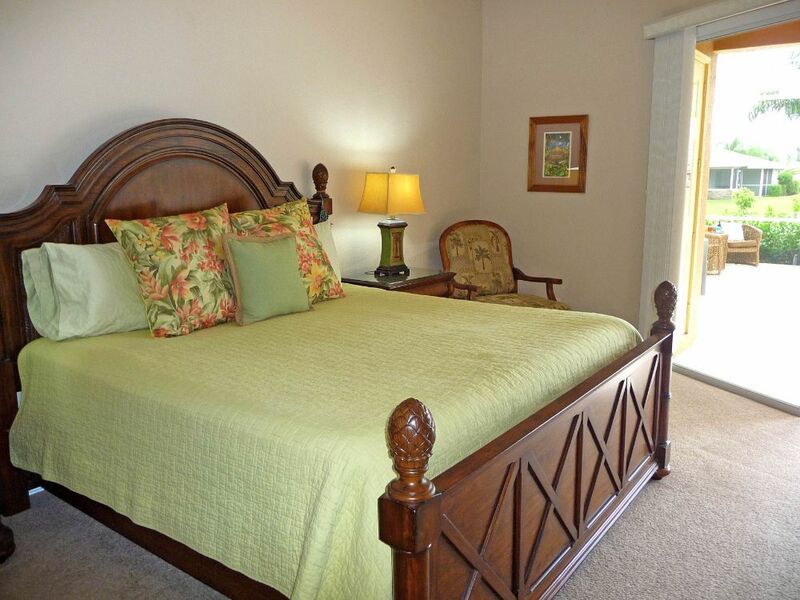 It comes furnished with a sumptuous King bed and flat screen cable TV. There are also sliding doors to the pool area. 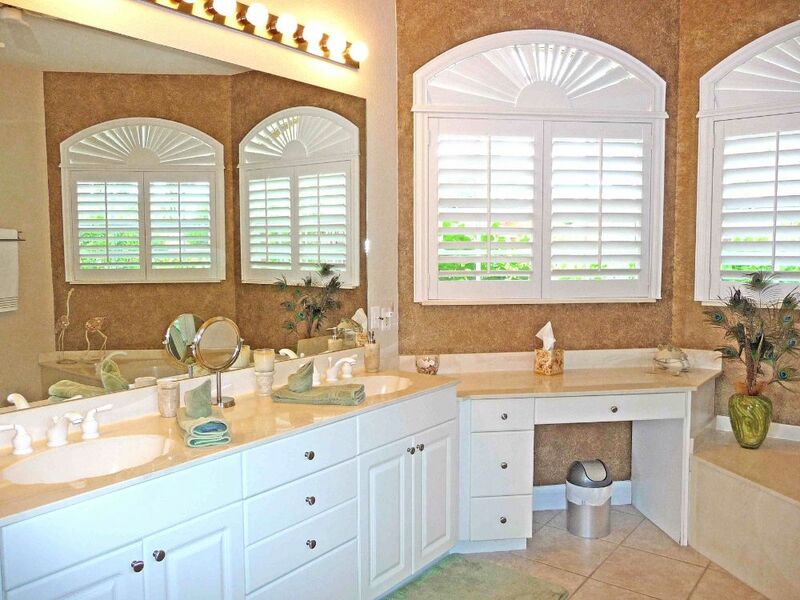 The adjacent Master Bathroom completes the Master area of the home. 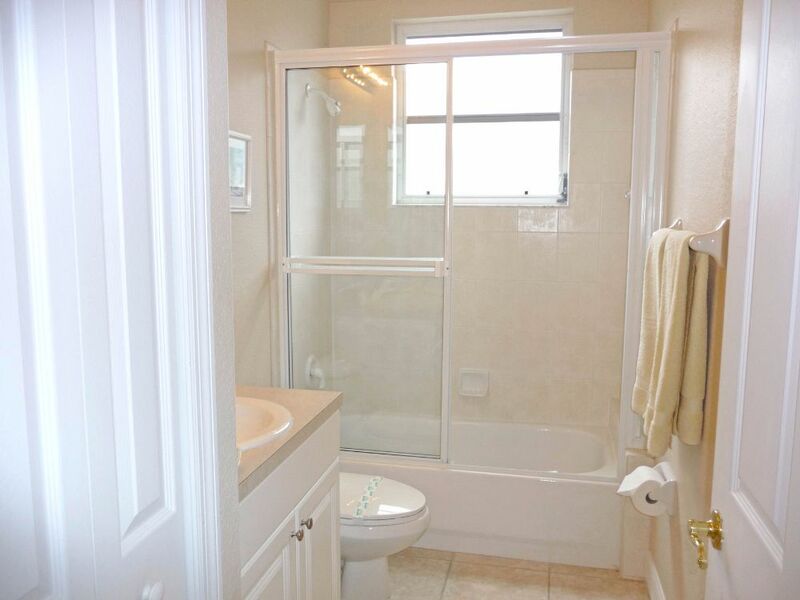 The Master Bath has a separate large walk in shower, sunken bathtub and his and her basin area. The 2 guest bedrooms, each with their own ensuite bathroom, are located on the other side of the house in a split plan design so to provide the ultimate in privacy for all guests.On stepping out through the large sliding glass doors, the pool and deck area is over-sized with plenty of space for lounging in the sunshine, alfresco dining or sitting quietly in the shade reading a good book! 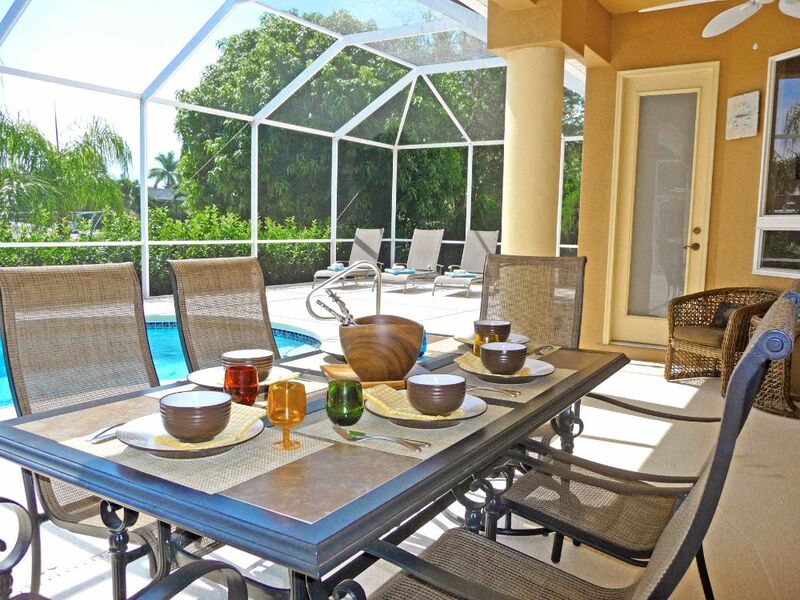 The home is also equipped with a large gas barbecue for outdoor dining and entertaining which is very much the focus of this wonderful home. 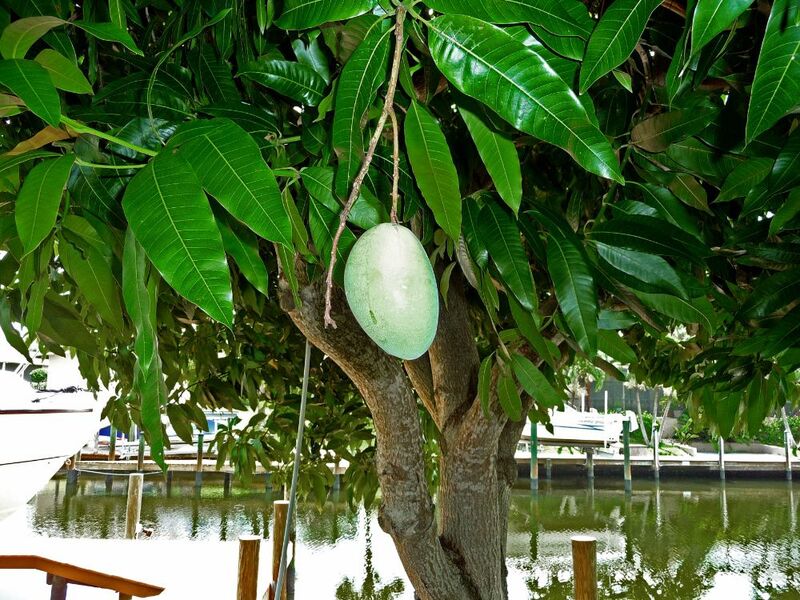 The surrounding grounds are beautifully kept and if guests visit during the summer months of June-July, you may be lucky enough to pick your own mangos from the home's private tree by the pool area!Villa Cabo Mango is the perfect choice for guests seeking a spacious modern residence, combined with one of Cape Coral's premier boating access locations.